Marjorie’s Seedling tree is an excellent plum for smaller gardens. It needs no pollinating partner and produces a tree full to the brim with deep purple-red fruit. Marjorie’s seedling plums get sweeter as they stay on the tree, a bonus for home gardeners who can wait, unlike commercial growers who pick early. If you love plums, try growing Marjorie’s seedling plum as a low maintenance, heavy producing fruit tree. Marjorie’s seedling plum trees will produce copious amounts of sweet-tart fruits for canning, baking or fresh eating. This variety is known for its intense flavor when allowed to fully ripen on the tree. The fruits are beautiful with deep color that turns almost purple black when mature. It is a perfect tree for a small garden because you don’t need another plum variety for it to set fruit. Marjorie’s seedling plums are small fruits with deeply yellow, juicy flesh. The trees can grow 8 to 13 feet (2.5 to 4 m.) tall with a bushy habit unless trained. There are several seasons of interest with this plum tree. In early spring, a cloud of pearly white flowers appears, followed by the deeply hued fruit and finally purple-bronze foliage in fall. It is in flowering group 3 and considered a late season plum with fruit arriving in September to October. Marjorie’s seedling tree is resistant to most common plum diseases and is a reliable producer. It has been around in the U.K. since the early 1900s. 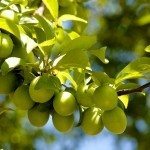 Marjorie’s Seedling is an easy plum tree to grow. These trees prefer cool, temperate regions and well-draining, sandy soil. Acidic soil with a pH range of 6.0 to 6.5 is ideal. The planting hole should be twice as wide and deep as the root mass and well worked. Water the soil in well and keep new trees moist as they establish. Water once per week deeply, or more if the temperatures are high and no natural precipitation occurs. Prevent weeds around the root zone. Use about an inch (2.5 cm.) of organic mulch to accomplish this and also to conserve moisture. Young trees should be staked to help them develop an erect trunk. Prune in summer to keep an open center and sturdy scaffold of branches. You may also have to tip prune to thin heavy bearing branches. Plums don’t generally need much shaping but they can be made into espaliers or trained to a trellis. Start this early in the plant’s life and expect a delay of fruiting. Fertilize in spring before the flowers open. If deer or rabbits are common in your area, erect a barrier around the trunk to prevent damage. These plums will usually bear in 2 to 4 years after planting. Fruit is prolific so be ready to share!